Arrange apps. 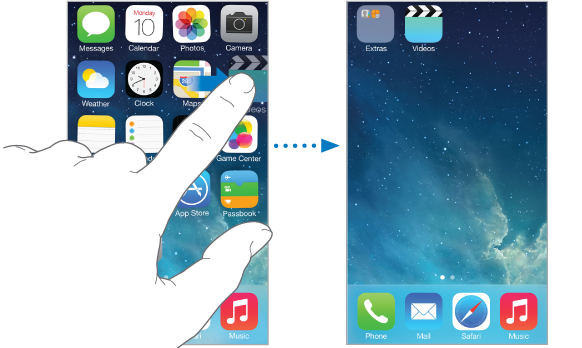 Touch and hold any app on the Home screen until it jiggles, then drag apps around. Drag an app to the edge of the screen to move it to a different Home screen, or to the Dock at the bottom of the screen. Press the Home button to save your arrangement. Create a new Home screen. While arranging apps, drag an app to the right edge of the last Home screen. The dots above the Dock show how many Home screens you have, and which one you’re viewing. You can also customize the Home screen using iTunes, when iPhone is connected to your computer. In iTunes, select iPhone, then click Apps.